"The first sweater she knit was MUCH too small..."
Once upon a time there was a girl who learned to knit. First she knit some very wonky scarves, then some somewhat better hats, then a set of fingerless mitts or two. She started out with 99 cent Red Heart super saver acrylic and eventually graduated to cotton and then wool, and some of her creations started to actually be wearable by her friends and family. But the first sweater she knit (see top) was much too SMALL. "I can't breathe!" she declared, and into the charity donation pile it went. Her third sweater was JUST RIGHT. So what's the magic secret to ensure a sweater you've labored and sweated over for months will actually fit when it's all blocked and sewn and finished up? Err slightly on the side of small. Negative ease is your friend. When I browse through finished sweaters on Ravelry, the number one issues I notice (and the main sweater issue my knitting friends seem to complain about) is too-baggy sweaters, like my second sweater above. With my successful sweater, I knit it with about 2-3" of negative ease. As I was going along, several people asked if it was meant to be for my daughter because it looked rather tiny, but after a good block, she was JUST RIGHT. That said, don't overcompensate for sizing issues. I made my first finished sweater (at top) from Stephanie Japel's excellent book Fitted Knits, which is chock full of great advice on, well, fitting your knits. 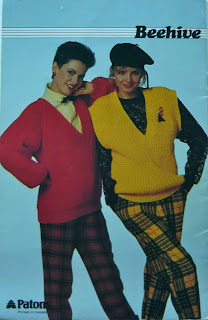 (She also has a Craftsy class on fitting your knits, which I would suspect is excellent). BUT... when I started knitting and tried it on, it was a little bit too big. So I decreased. And decreased. And decreased some more as I went. And... Yeah, I seriously overdid it. So don't do that. You've been warned. Being able to breathe is a good thing. Choose a fiber with good recovery. Honestly, I think this was my biggest mistake with Sweater the First (knit in a cotton/tencel blend) and Sweater the Second (knit in a cotton/silk blend). Cotton and silk have very poor recovery and stretch and not so much elasticity and bag and sag over time. Even if you knit an in-the-round cotton sweater that you can try on as you go, it's not really a good predictor of how it will actually fit once you start wearing it. So they require extra fitting care and even more in the way of negative ease. Wool (and some of the nicer microfibers and acrylics if you must) on the other hand is plush and bouncy and springy and elastic. It tends to keep its shape and stretch with your body—but not too much. I've been wearing my Sweater the Third for weeks now, and it hasn't increased a bit in size. AMAZING. Note that this is NOT necessarily true of machine-washable aka superwash wools, which have had some of their little prickly bits smoothed off chemically to prevent felting. I've read that many of these bag and grow quite a bit after wash and wear. I'd rather handwash my sweaters than suffer another Sweater Size Tragedy, so non-superwash wools are it for me! Phew! So what's your biggest knit fitting disaster? I absolutely agree with everything you've written. Mikhaela - they are all beautiful sweaters. Did you really have to remind me about baggy sweaters? I'm keeping quiet now before I sink myself. Please don't be sad, there is a happy ending to my baggy sweater story... I refashioned it last night to fit, will post about it soon! I've found that 4-5 inches of negative ease is preferable - unless it's a cardigan. I won't knit with silk, cotton or most superwash at this point. It's too unpredictable to spend so much time on. Yeah, with a cardigan I think TOO much negative ease can result in gaping button bands... But yes, probably at lest 4 is probably good. Unfortunately the sweater on top had maybe 10 inches of negative ease... OOPS. This is great advice! I'm trying to gain the confidence to knit my first sweater - I'll be referring to this post for sure. I hope I haven't scared you! I think the key is setting yourself up for success with (1) a pattern knit in the round that you can try on as you go in (2) a yarn with great stretch and recovery and probably (3) a worsted-weight yarn so it doesn't take eons to finish. Fabulous advice. I can't wait to see the refashioned baggy sweater. Lucky was the person who received your too tight sweater, it was gorgeous. Two mistakes I seem to always make are: buying inexpensive yarn (thus sweater looks worn after two washes), and knitting at too loose of a gauge (fabric ends up net-like and ends at the knees instead of hips). So, now if I am going to spend umpteen hours knitting a sweater and want it to last for years, I buy a very high quality yarn and knit at a gauge often tighter than the pattern calls for. Swatch swatch swatch then wash it, carry it in my pocket, hang weights from it, abuse it, etc. Oh, that's a great tip. 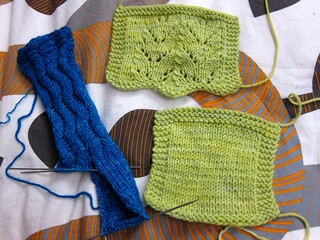 Knitting tightly also works really well on socks—it helps keep the toes and ankles from getting holes so quickly. I've knit just one sweater and, through no fault of my own, the fit was spot on. 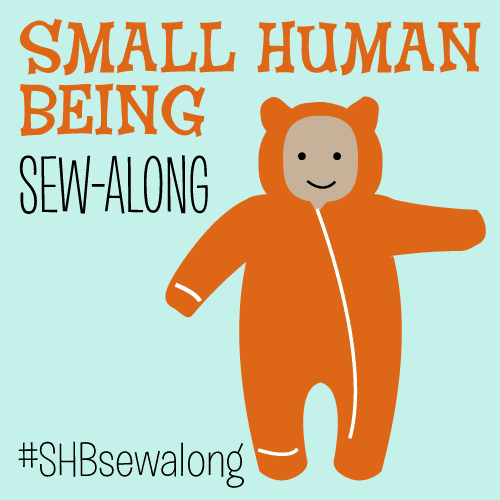 Really, I was waffling between two sizes and picked the smaller and then knit it just a little bit tight. So, yes, exactly - you need some negative ease. I was convinced that there was no way it was going to fit the whole time I was knitting it. But it did. 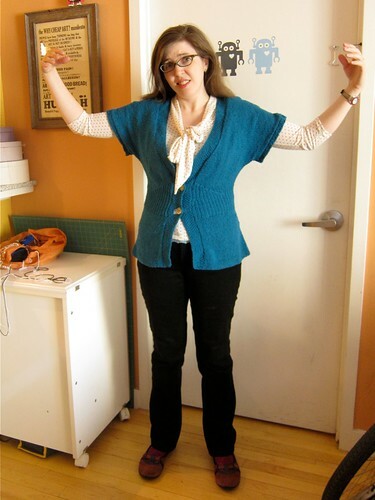 I carefully knit a shawl collar cardigan, with a knit-on collar, in an acrylic blend boucle. I seamed the body, tried it on, and realized the shoulders were 2.5" too wide! It sat in time out for a few years, then I decided to cut off the excess. I tested the serger on my gauge swatch, got the tension right, and cut the excess fabric off the first shoulder. When it came out of the serger the armscye was stretched out probably double! It's in time out again, until I get the optimism to try to wet block it back into shape. That's probably my worst sweater disaster.